If these two can learn to stand each other ... the bad guys don't stand a chance. A veteran cop, Murtough (Glover), is partnered with a young homicidal cop, Riggs (Gibson). Both having one thing in common, hating working in pairs. Now they must learn to work with one and other to stop a gang of drug smugglers. $6.829 million on 1256 screens. When all is said and done, Lethal Weapon may embody the "typical” 1980s action film better than any other. As I watched it from the vantage point of 2012, I couldn't help but think it looked like some sort of "greatest hits" reel. All the 1980s standbys were there: wisecracking cops, ultra-violence, and a hip soundtrack. It's also a pretty good movie. After 25 years and three decreasingly interesting sequels, it became hard to remember that the original Lethal Weapon possessed an edge that clearly quickly evaporated as the series became a franchise. Martin Riggs' (Mel Gibson) depression actually plays a role in the plot of Lethal Weapon, something it would never do again. It also makes him much more of a human being than the goofball supercop he turned into later. Not that Lethal Weapon can be called realistic drama. It's a fairly cartoony little ride, but the historical perspective of how pathetically artificial and superficial the characters would become certainly makes them seem more true to life here. Gibson is not now -nor has he ever been - one of my favorite actors, but he gives Riggs the proper form of demented charm. I'm not sure I ever believed Riggs was truly suicidal, but Gibson comes closer to a vivid performance here than he would later be capable of doing. Danny Glover seems decently effective as middle-aged family man Roger Murtaugh. However, I have a much harder time viewing his character with historical detachment than I do with Riggs simply because the aging cop nearing retirement as become such a cliché. Murtaugh may have been a fairly original character back in 1987, he's now a stereotype, and it can be hard to appreciate Glover's work on its own. Still, he's pretty believable in the role, and he does a good job of grounding Riggs' psycho tendencies. On their own, neither actor performs at a level that seems particularly noteworthy, but as a pair, they do radiate a chemistry that undeniably adds appeal to the film. I think it's actually largely because of the winning combination of Gibson and Glover that the Lethal Weapon series continued and prospered for so long. While the movies increasingly relied on their alleged comedic banter - to the exclusion of niceties such as plot and character development - I guess that shouldn't eradicate the fact that at the start of their run, at least, the two offered something different and compelling. The plot for Lethal Weapon is your standard issue 1980s action movie kind of thing. I won't even bother retelling it in any detail; drugs and bad guys, heroes gotta rescue people, blah blah blah. While there's nothing new here, at least the story doesn't get in the way of the main assets of the movie: the chemistry between Gibson and Glover and the fairly well executed action sequences. Richard Donner has directed many, many movies over the years, and he's a capable director, but never more than that. Donner's above average but nonetheless pretty pedestrian. He keeps Lethal Weapon moving at a decent clip, but he never threatens to make it a truly memorable experience; overall, it's interesting and compelling but not spectacular. Lethal Weapon appears in an aspect ratio of approximately 1.85:1 on this Blu-Ray Disc. No severe problems cropped up here, but the movie still never offered a terribly memorable presentation. Sharpness usually seemed acceptably crisp and well-defined, though a bit amount of haziness occurred as well. Occasional bouts of mild softness occurred, usually during interior shots. Much of the movie appeared acceptably distinctive, though. I noticed no jagged edges or shimmering, and edge enhancement seemed to be absent. Source flaws were also negligible. A few specks cropped up but not with any regularity. Hues seemed a little muddy and bland during most of the movie, as Weapon often presented a rather brownish look. On some occasions, I thought colors appeared acceptably bright and accurate, but these were rare; mainly the hues came across as flat and without much life. Much of that related to production design and film stock, as 80s movies often came across this way. Black levels were decent, though, and shadows tended to be reasonably clear. Neither of those elements excelled, but they didn’t cause concerns. This was a generally positive picture despite the occasional problems. As for the movie’s DTS-HD MA 5.1 soundtrack, it remained oriented toward the front spectrum. The forward channels displayed acceptable spread from music and some effects and the audio blended together fairly well. Surrounds kicked into gear during action scenes, but I didn’t think they were especially involving. The track had a somewhat artificial feel to it and didn’t become as engrossing as I’d like. Audio quality was decent but fairly bland. Dialogue sounded mildly thin and reedy. However, the speech usually came across as distinct and easily intelligible with no signs of edginess. Effects were clean and decently realistic but they lacked much clarity or force. Music was similarly smooth but without great dynamics; the soundtrack offered modest low end but did not stand out in any way. As a whole, the mix was roughly average; it offered a listenable but uninvolving experience. The DVD came with virtually no extras, but a few components round out the Blu-ray. We open with an audio commentary from director Richard Donner. Along with an unnamed moderator – and an off-microphone interviewer – Donner delivers a running, screen-specific look at cast, characters and performances, music, stunts and action, story and themes, sets and locations, and a few other production areas. Prior Donner tracks have been spotty, and that trend continues here. We get an awful lot of dead air, and the format is annoying, mainly because we often hear Donner’s answers but not the questions themselves. Donner’s comments vary from moderately informative to totally banal. While we do learn a reasonable amount about the film’s creation along the way, it’s a tough trek. 14 Additional Scenes fill a total of 29 minutes, 44 seconds. Expect most of these to extend existing sequences or themes, as only a few of them develop new concepts. That means the nearly half-hour of footage includes a lot of material already in the final cut, so we don’t have a ton of truly new shots. Still, it’s interesting to see some of the excisions, so this becomes a nice collection. In addition to the film’s trailer, we locate a Music Video for Honeymoon Suite’s “Lethal Weapon”. I don’t remember Honeymoon Suite, but based on this video, they seem to have been one of many Night Ranger-style banal rock bands from the 80s. The song is utterly predictable and forgettable, and the video is just a lame mix of movie clips and cheesy lip-synch footage. Ugh! An influential “buddy flick”, Lethal Weapon holds up reasonably well after 25 years. While it’s not a great film, it creates decent entertainment and remains easily the best in its franchise. The Blu-ray provides erratic but generally positive picture and audio along with some similarly erratic supplements. Nothing here excels, but this becomes a fairly strong home video reproduction of the film. 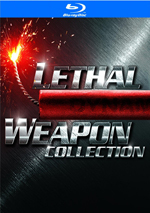 Note that as of May 2012, this version of the film is current available only as part of the five-disc “Lethal Weapon Collection”. It includes all four of the flicks in the franchise and presents unique Blu-rays; the box does not simply repackage the versions already available individually. It also throws in a fifth platter with bonus features.